Quality of the air in houses and buildings becomes really big problem. Indoor air often contains formaldehyde. This harmful substation is emitted from smoky carpets, glues, volatile organic compounds, artificial flavors and a range of chemicals contained in softeners. Detrimental chemicals cause skin allergies and respiratory problems. It’s very important to ventilate homes regularly. Nature helps people with reunifying home air. There are plants and other natural products and substations, which can keep indoor air permanently fresh and healthy. Nature gives us some plants that neutralise air. Just choose one that will match to your domestic interior. Bamboo Palm, Chrysanthemums, Ivy, Ficus, Dracaena Spathiphyllum or Lily of peace (don’t use it if you have a cat – it can be toxic), Tradescantia or Purple heart, Chlorophytum Green Lily flower, Hoya or Wax flower. 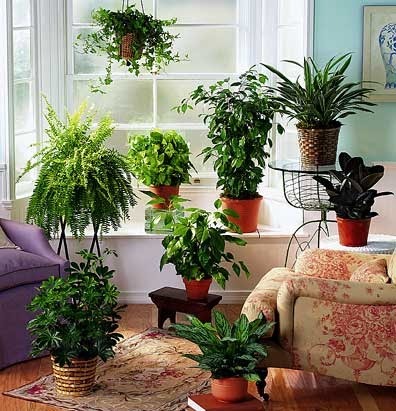 These plants relieve the effects of benzene, formaldehyde and trichloroethylene and etc. Natural substations: Mix ½ cup of borax powder with 4 liters of warm water. Add a few drops of fragrant essential oils of thyme, rosemary and lavender. Store the mixture in a labeled spray bottle. This can be used as a disinfectant as well. Acid of lemon juice or vinegar removes a strong unpleasant smell. Pour a little of the liquid and allow it to dry. It is mighty anti-smelling substation. Most of the odours are result of condensation and dampness. Put some natural forest moss in the pots of flowers. Moss is a plant that absorbs the air dampness. We seldom think about how our lives depend on the quality of the air we breathe, while we are at home. People in developed European countries spend 90 % of their time indoors. A person uses 10 kg to 30 kg of air (over 25 000 liters), one kg food and 1-3 liters liquids a day. It’s known that the air we breathe has a great influence on our health, self-confidence and working process. According to a survey, thousands of Europeans die annually because of disease, caused by contaminants in offices and homes. So, don’t forget to include air refreshment in your domestic cleaning routine. Live healthily and breathe pure and fresh air! Do what professional cleaners do and finish your home sanitising with good air refreshment!